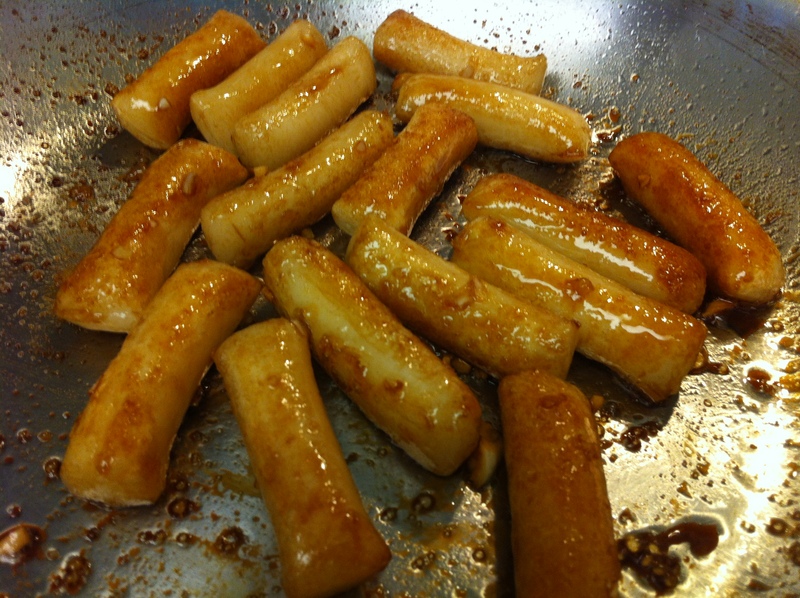 If you are on a diet, beware of this dish… fried rice cakes! 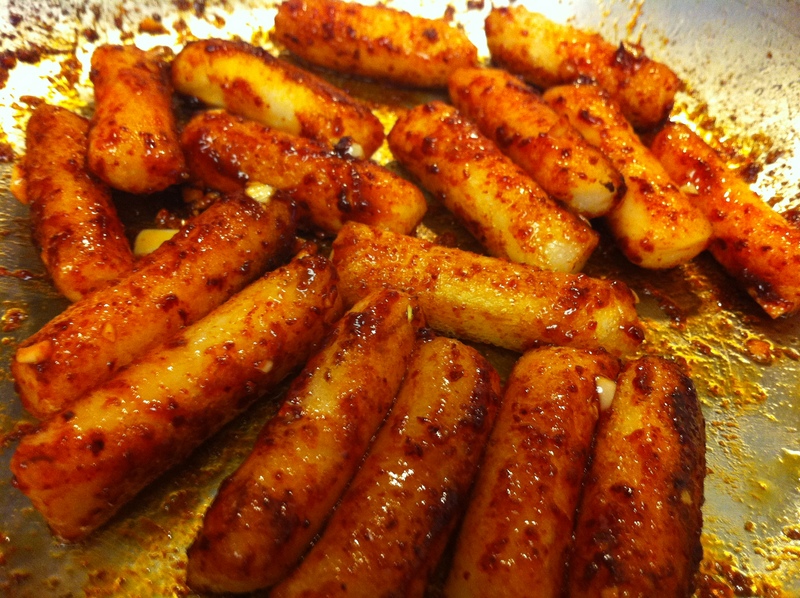 Gireum-ttuckbokki (기름떡볶이) is sinfully delicious and simple to make, although probably not the best for those on diets. 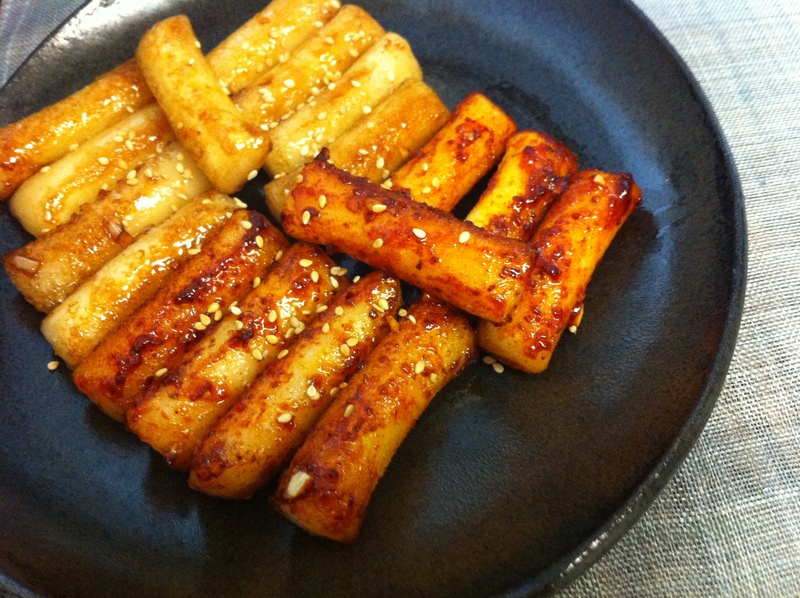 I love this version of ttuckbokki especially because it is crispy, soft and chewy. I made a spicy and mild version made with gochujang (고추장, red pepper paste) and soy sauce. You can make this a healthier version by making it with rice cakes made with brown rice (현미떡), which is easier to find these days. Mix the soy sauce and gochujang marinade. 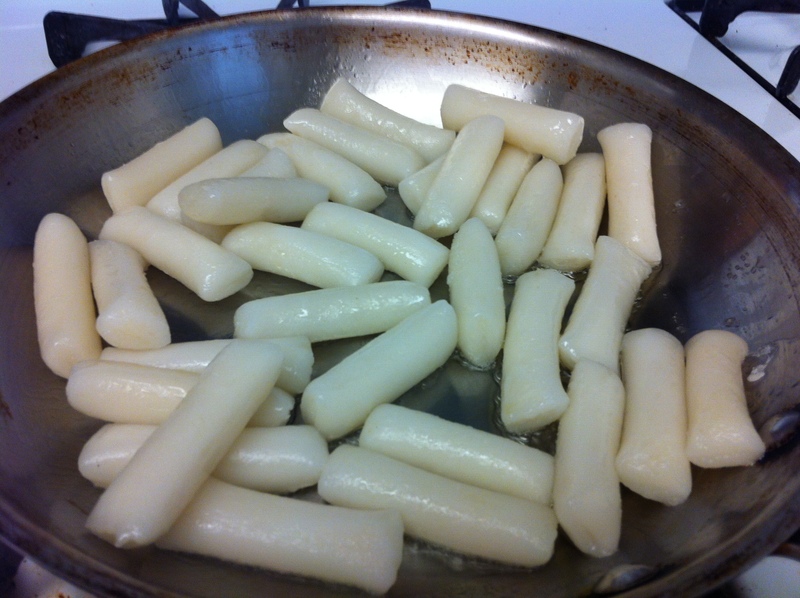 Boil the ttuck (떡, rice cakes) in water for about 3-5 minutes until they are soft but not mushy. Drain and quickly rinse in cold water. Coat the ttuck with sesame oil so they do not stick together. Drizzle about 5 tablespoons of vegetable oil on a skillet. 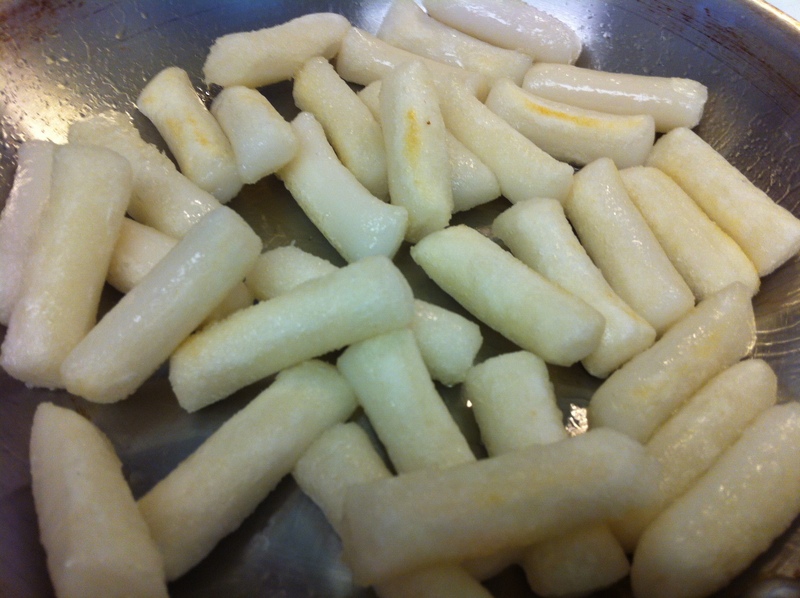 Fry the ttuck (떡, rice cakes) on high heat for about 5-7 minutes until the surface is crispy. Set aside 1/2 of the fried ttuck for later use. Stir in about 3-4 tablespoons of the soy sauce marinade with the ttuck on the skillet. Taste and add more marinade if needed. Remove the soy sauce gireum-ttuckbokki on a plate. Drizzle about 1 tablespoon of vegetable oil on the same skillet and add the remaining ttuck. Stir in about 4 tablespoons of the gochujang marinade. Taste and add more marinade if needed. Plate the gochujang gireum-ttuckbokki. Garnish both giruem-ttuckbokki with a sprinkle of toasted sesame seeds. 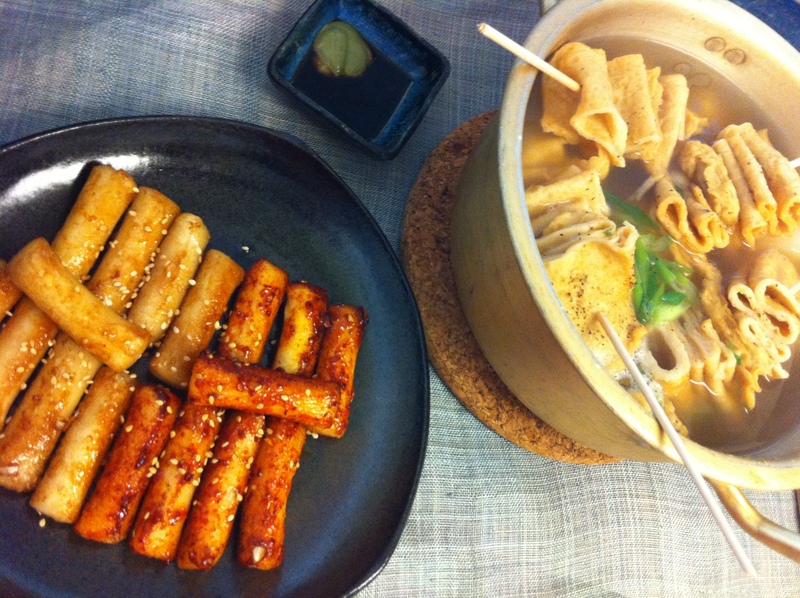 This entry was posted in Appetizer, Dessert/Snack, Good for lunch, Main Dish, Vegan/Vegetarian Options and tagged Ttuck, Ttuckbokki by gangnamkitchen. Bookmark the permalink.